Beartooth, a set of young men with one goal in mind, to create havoc on stage with tuned down guitars and hard rock sound. Their new album Aggressive is definitely one that blares the evolution of this band. Their previous work –Disgusting, was a bit more punk/hard rock, but this new full length album is heavier perhaps they are creating a new sound derailing from their punk influences and Adding more rock and roll riffs and drum blasts. Formed in Columbus, OH in 2012 and signed to Red Bull Records since 2013 this band is giving you metalcore sounds. 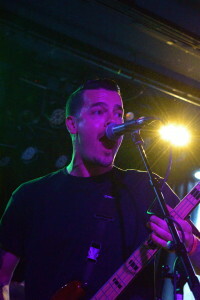 Vocally the Caleb Shomo remains aggressive and screams off the top of his lungs in songs like “Hated” and the self-titled song “aggressive”. The Roxy Theater definitely had no idea of the power this band has and the die-hard fans energy intensified, as Beartooth would relentlessly project their heavy sound. Playing for a small venue is definitely a mistake as the crowd jumped, smashed and destroyed the stage. Fans would climb the stage and crowd surf relentlessly as Caleb would scream the lyrics to some of the fans favorites as well as new tracks. The mosh pit was brutal as both guys and girls would savage one another, giving no room to breathe the fans would voraciously dance and headbang on the floor. Both Taylor Lumley and Kam Bradbury would deliver a brutal set of riffs during their performance and amp the fans. While on bass Oshie Bichar would give the power to this band, one which urges listeners to body slam their concert buddies and other surrounding fans! The band was energized as they had been fed at their pre-party by Taco Bell and perhaps ingested some Red Bull at the Red Bull Records headquarters in Hollywood. You can definitely sense the love the fans of Beartooth projects towards them, if you have not yet picked up the new album Aggressive which was released on June 3rd via Red Bull Records make sure you pick up a copy.